Normally at this time of year a we along with a group of friends and neighbours book a suitable local venue for a pre-Christmas dinner but this year for one reason or another this was not on the menu. But hey, can’t let the festive season pass without some kind of celebration! So much to the relief of ‘suitable local venues’ it was decided that six of us would indulge in a leisurely pre-Christmas break on Dartmoor. I say ‘leisurely’ because for once it would not involve a ‘crack of dawn’ start but a more relaxed mid-morning departure, nor would it encompass a holiday cottage but a one night stay at a local hotel. As Christmas is a time of reflection this would be a chance to revisit my old home town of Chagford and a one nighter at The Globe Inn. So having finally got our two girls out of bed the family along with our Dartmoor loving friends Rhys and Louise set off down the M5 motorway at 11.30 am. I must say that for a Saturday the normally busy Westcountry artery was pleasantly quite which made for a journey that for once never sent my blood pressure rocketing. It is said that; ‘one should never visit the past,” and the first major change could be seen at the Whiddon Down Services. I remember this as being a small petrol station here I would buy my diesel and the occasional household necessity such as cigarettes. But Wow, now the place had given birth to a Subway counter, a Costa Coffee station, a supermarket along with a Travel Lodge and a ‘Hog and Hedge restaurant. Immediately the girl’s little faces lit up like an Osram bulb when they spotted the Subway sign so here was going to be a whole new dining experience for me. Up until this point my claim to fame was that I had never eaten a Subway offering and what a bewildering choice it was. The two girls strolled up to the counter with the confidence of regular patrons and ordered their normal sandwiches. Then it was my turn, which of the four types of bread would I like? which combination of ingredients to go with it, did I want melts? and did I want a six inch or one foot offering? Before long the queue behind me had stretched back to Exeter and so a hasty decision was made, gossamer thin slices of ham and turkey suffocating in some glutinous substance that had the audacity of calling itself cheese. Thank God I never went for the one foot option and next time I will stick to my pre-packed egg and cress sandwiches that at least show some resemblance to ‘what it says on the tin’. As we made such a late start we decided to visit Fernworthy and just take a stroll around the reservoir as it would be close to our final destination at Chagford. On the way there I took the opportunity of re-routing past the delightfully named Mucksy Lane Cross and the little cottage where I once lived. This brought back some great memories especially wintertime, coming home and going to the log store, lighting a blazing fire and settling down for the dark, clear, crisp nights. Bedtime was especially memorable as initially the room was like a refrigerator but once under the thick quilt things soon warmed up and sleep was preceded by staring through the skylight at the crystal night sky lit up with thousands of twinkling stars. There was never any need for a morning alarm as the old muck-heap cockerel made sure of that. Even better the Moor was just down the road, pity it was closed for some of the time due to the Foot and Mouth outbreak. By the time we had reached the northern edge of Chagford Common the remnants of the previous day’s snow lay in pockets across the moorland, much to the girl’s delight. This half and half landscape always seem sad to me, it’s not a white winter wonderland nor is it cloaked in the drab winter’s beige and russet hues. However, once the warm clothes were donned it was good to get out into the bracing moorland air and set off around the still waters of the reservoir. I have visited Fernworthy on many occasions but never been to the reservoir so this was new ground for me. The first striking thing was how quiet it was, literally not a sound to be heard apart from the occasional lapping of the water. Work on building the reservoir began in 1936 and was finally completed in 1942, its purpose was supply water to the Chagford, Exeter, Newton Abbot, Brixham and Torquay areas. The reservoir holds up to 177 million litres of water and covers an area of some thirty hectares with a depth of some twenty metres. The actual granite dam is 209 metres in length. There were several hold-ups during the construction work which prompted one Torquay councillor to make the rather acidic comment that; “The Walls of China took China 54 years, and at the rate we are going on, this job is going to take 64 years.” One of the reason for the delays was the very nature of the Fernworthy landscape along with the palimpsest of historical features within it. Underneath the waters lay a plethora of prehistoric hut circles and cairns along with remains of later tracks and bridges. Many of these features re-emerged in 2016 when the water levels dropped dramatically as they have done at various times in the past. Now our two girls love Dartmoor or to be more precise love Dartmoor ponies of any shape or form and having been told in no uncertain terms there would be none around Fernworthy were ecstatic to see a small herd rummaging through the snow covered grasses below Thornworthy Down. Good news for them bad news for us as it now meant a good fifteen minutes whilst they all became acquainted. Having finally managed to drag them away from the ponies we trundled on a bit further when it soon became evident that the evening light was beginning to draw in. Flocks of geese and ducks began arriving for their evening accommodation which suggested that if we wanted to get back to the car in what little daylight was left we must return ASAP. Unfortunately that meant the complete circuit of the reservoir had to be put on hold until another day. So after some final snowball fights and a team photo we headed off to Chagford for a night at The Globe Inn. Throughout my career I have stayed in hundreds of hotels, inns, and pubs many which have been on and around Dartmoor but The Globe was a newcomer to me. We were greeted with the sight of several sparkling Christmas trees lined up outside the inn. But as far as decorations go these were nothing to what greeted us inside, every room was festooned with Santas of every shape and size, they were everywhere and what an amazing sight. Forget the log fire blazing in the hearth which normally would have got the ‘ahhh’ factor everyone’s attention was on the Santas. These were not any old Santas, no, this collection belonged to Mary, one of the owners and is apparently one of the largest privately owned collections. She has been collecting figures of Father Christmas since the age 0f six and now has an ensemble of more than six hundred in her collection. What was on show was only part of her collection the rest being safely stored in the attic. It has now got to the stage where people from all over the world send her new additions to her Claus family which was evident from the variety of costumes and appearances. It immediately became evident that our choice of stay was a good one. After a very friendly welcome we booked in and decided to revisit some of my old pub haunts in the town. Now I remember the Three Crowns as being a very traditional moorland inn with many original features but what a shock, glass panels everywhere and bar staff in very twee uniforms. Come on for God’s sake this is Dartmoor not Sloane Square. Nevertheless we ordered a round of drinks which incidentally came to £18.40p, remember that figure for future reference, quickly downed them and thankfully moved on to the Ring of Bells which is about fifty yards up the street. This was more like it, dogs everywhere and not a pink pair of gentlemen’s cord trousers anywhere to be seen so we ordered exactly the same round of drinks as at the Three Crowns, it came to £14. 30p. How can there be a £4 difference for the same drinks within fifty yards of each other? maybe due to the overhead costs of the window cleaners who tend to all the glass panels? From the Ring of Bells we returned to The Globe Inn where I was meeting up with Emma Cunis who runs the Dartmoor’s Daughter and is a Dartmoor guide offering a whole range of walks and experiences. In my opinion there is nobody better to undertake such activities as she is the granddaughter of the esteemed guide and Dartmoor writer – Eric Hemery. We both have a deep passion for everything ‘Dartmoor’ so it’s always great to have a catch-up and chat about the Moor. OK, back to The Globe Inn . The Globe Inn began life as a coaching inn way back in the 16th century and was originally called The Gregory’s Arms. During the late 1800s and early 1900s the inn was a departure point for horse drawn carriages and later motor coaches. In 1850 although by then called The Globe Inn it was owned by Henry Gregory who at the time was recorded as also being a cooper. His cooperage was located at the back of the inn where he made beer and cider hogsheads along with quart firkins for labourers to carry their cider in. 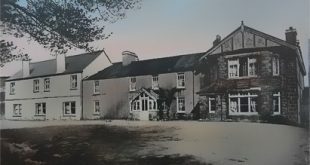 At the Moretonhampstead Petty Sessions held on the 6th of November 1876 the licence for The Globe Inn was transferred from Henry Gregory to one James Hutton It is said that by the 1880s The Globe had become an hotel which catered for the growing number of visitors to the area. During the 1800s various court sessions were once held at The Globe Inn which covered the parishes of Chagford, Gidleigh and Throwliegh. In 1926 a tragic accident occurred at the hotel involving a seventeen year old chambermaid. At her inquest one witness stated how at 8 o’clock in the morning she saw the young girl in the kitchen leaning over a table and reading a newspaper. She then heard the girl call her name and went to investigate and saw the chambermaid standing in the yard engulfed in flames. She grabbed a nearby mat and attempted to extinguish the flames but the young girls ran off. The hotel manager was the next witness and he stated how he had heard the screams coming from the kitchen and dashed of to see what the problem was. He then noticed the chambermaid running along the passageway with her clothes on fire. He too grabbed a rug and wrapped it around the girl thus managing to put out the flames. The young girl was immediately put to bed and a doctor and nurse were summonsed who then rushed her to Moretonhampstead hospital. The girl was then transferred to newton Abbot hospital where a few days later she died from blood poisoning due to her burns. Before her death she told a nurse that she was feeling cold and so was standing with her back to the fire and that a spark must have fallen out and set her clothes alight. – The Western Times, April 19th, 1926. No Christmas would be complete without a ghost story and the Globe Inn can more than meet that demand. Centuries ago there was a chambermaid working at the inn who also was said to have healing powers. As there were no medical services the locals would come to her for various lotions and potions to cure their illnesses. Unfortunately one of customers died following her treatment and it was said it was that the fatality her fault. Immediately she went from a good hearted healer to a loathed and feared witch. To prove her guilt she was tied to a chair and lowered into the nearby river, if she survived then she was innocent but if she drowned she was guilty of being a witch. It should come as no surprise that she drowned and to this day many guests staying in one of the upstairs rooms report a strange eerie presence. If you would like to meet the ‘witch ghost’ simply ask to stay in the Azalea room and you wish may be granted. Luckily this story was told to us in the morning as I think if the girls had known about this on top of what they experienced little sleep would be had. Again in the morning the ladies reported a strange happenings in their room the previous night. Apparently the television mysteriously switched itself on with its volume turned up high on two occasions with no logical explanation. We were told that quite a few other guests have had the same experience and despite getting the electricians in to investigate they could find no reason as to why this should happen. Oddly enough I had a similar problem with a lamp and it was only when it was unplugged that it was exorcised. Rhys and Louise also had an odd experience in the morning, it being a bitterly cold morning the glass in their room’s window began to steam up. As it did some strange writing that had been scratched into the glass slowly revealed itself – the only legible word was ‘Alice’ – see below. Before breakfast there were a couple of photographs which I needed which meant facing nothing short of howling gale-force winds which certainly blew away the beer cobwebs clogging up my brain. Firstly I wanted a photo of the old churchyard cross for my Facebook group – Dartmoor Crosses, which as it turned out was still decked with poppy wreaths. As can be seen above the cross comprises of two joined pieces its head and arms along with the shaft. The cross head once belonged to a much older cross and the fragments were found built into a wall at Holy Street Manor but prior to this it was said to have stood in the market place. The shaft is more recent addition and was added to the head when in 1928 the cross was restored whilst extensions to the graveyard were taking place. The final part of the ensemble is the socket stone in which the cross now sits. This was thought to have belonged to another cross associated with the town, this was rescued from Southmead House where it served as a drinking trough. The other photo I wanted was the grave of the famous Dartmoor guide – James Perrott, it was he amongst many other things has been credited with the birth of Dartmoor letterboxing. Truly a Dartmoor character of the 1800s whose legacy lives on today. By the way I had searched for this grave on another occasion with no success but thanks to Emma for guiding it to me the previous night it was easily located. You can read much more about James Perrott on my Legendary Dartmoor page – HERE. So having partaken of a sumptuous breakfast it was time to take our leave of The Globe Inn but before leaving we had another debate about a mysterious painting which hangs in the main restaurant. It basically is a canvas covered with what appears to be one huge blur of nothing in-particular but what was interesting were the various interpretations of what it depicted. I suggested the head of a King Charles spaniel, Rhys saw a waterfall amidst woodland with other suggestions being trees and a lake. Apparently this painting is a popular talking point amongst other guests who also come up with various other ideas. So with the gale-force wind at our backs we left Chagford and made our way home, speeding at least 108 miles an hour past the Subway service stop much to the anguish of the girls. On approaching Bristol the heavy rain slowly turned to sleet which slowly turned to snow by the time we reached home which gave the girls hope that school may be cancelled the following day. So what were our thoughts on The Globe Inn? I think the words; “we can’t wait to go back again,” more than sums up our delightful stay. If you want to stay at The Globe Inn all their details can be found on their website – HERE. p.s. For once the advertised WiFi facility at The Globe Inn was excellent much to the girls delight! Merry Christmas from Angela, Louise, Holly, Trinity, Rhys & Myself. But what a better way to herald in Christmastime than good friends, good company, good food and faultless accommodation and DARTMOOR! If willing, one day I should like to show you one or two Dartmoor treasures of my own discovery.